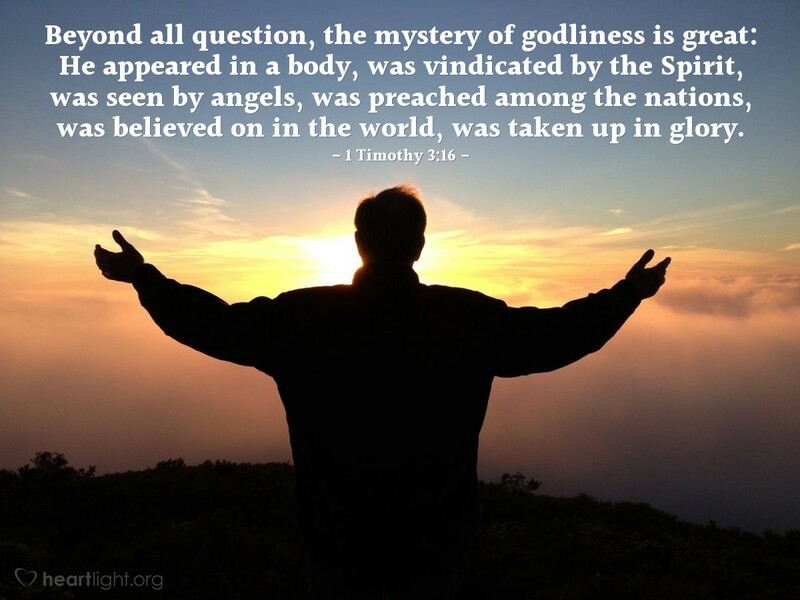 Beyond all question, the mystery of godliness is great: He appeared in a body, was vindicated by the Spirit, was seen by angels, was preached among the nations, was believed on in the world, was taken up in glory. Why would Jesus do it? How did he do it? How was he "God with us" and still in "human flesh"? We cannot fully comprehend it, but he was! The Son of God was also Jesus of Nazareth, born and placed in a manger and crucified on a cross. But he was raised from the dead and shown to be God's Son with power. He was seen by angels, both on earth after his resurrection and in heaven at the throne of God. He has been preached and believed on by people all over the world. The glory that he has he will one day show and share with us. If you want to understand godliness, then you begin with Jesus! Holy and marvelous God, your plan to redeem and save a sinner like me, along with those like me all around the world, is incredible. Your love that led you to such sacrifice is beyond comprehension. I thank you for this overwhelming grace. I ask you to forgive me of my sins. Please empower me with your Spirit that raised Jesus from the dead so the mystery of your godliness may be seen in my life today, in my family, among my friends, before my co-workers, by those with whom I attend school, and especially in the presence of my enemies. In Jesus' mighty name I pray. Amen.